That whiten by night the Milky Way. Snow is that magical precipitation that turns our stark winter landscape into a winter wonderland; gives school children joy at the possibility of a day off – SNOW DAY; and gives commuters white knuckles as they navigate home on slippery roads. Snow is what we expect to see each winter here in New York State. But what is snow? How is it formed? Is it true that no two flakes are the same? Snow will form in clouds between the temperatures of -39˚F and 32˚F. Clouds are mostly filled with tiny water droplets, tiny meaning that thousands can fit in a period. Microscopic dust and salt particles from the land and sea are also found in clouds. As the dust and salt cool in a cloud, they attract the tiny water droplets which stick and freeze to the particles – beginingthe formation of a snow flake (or the scientific term snow crystal). These tiny snowflakes grow by collecting more water molecules. When they get too heavy to be in the cloud they start to fall to the ground. As they fall, they bump into other snowflakes causing pieces (tiny crystals) of the snowflake to break off which become new snow flakes. The humidity and temperature inside the clouds will determine which type of snowflake is formed. If the air is moist and warm (25o-32o F) large flakes will form. If it is cold and the cloud has little moisture, the snow that forms resembles tiny columns. 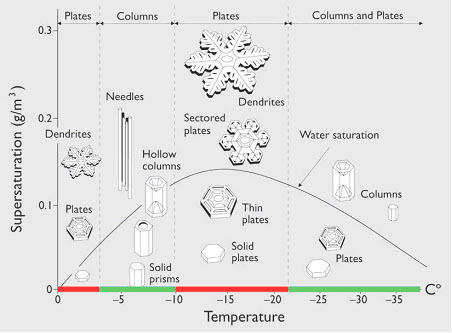 Figure 1 illustrates how different types of snowflakes form in different cloud conditions. Figure 1. 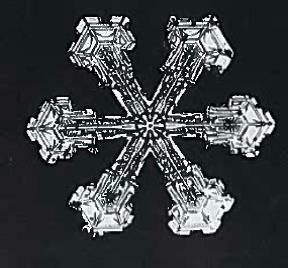 Snowflake shapes at different temperatures and humidity (“Supersaturation”). 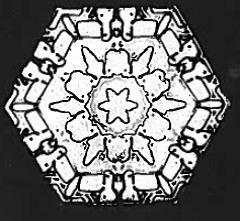 Why do snowflakes have a six-sided symmetry? Snowflakes are six-sided because of the way that the individual water molecules connect together – they form hexagonal lattices which give the snowflakes six-sided symmetry. Six-sided flat crystals with various amounts of surface patterns. Largest of these can be just under ¼” across. 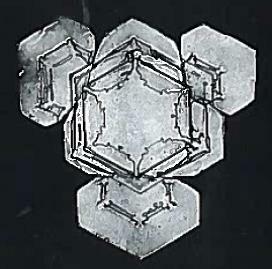 Hexagonal plate crystals are found in most snow falls. Stellar crystals are six-pointed star shaped snowflakes. These flakes can be up to 1/2″ across. They can be found in low numbers in most snow falls. Formed in the low atmosphere when the temperatures are not too cold and the humidity is high, sometimes the stellar crystal flakes join together to form large flakes that are 2” across. The gentle drifting of the stellar crystal flakes gives a tranquil feeling to snowfalls. Forming in cold clouds and low moisture, column crystal flakes are six sided and can be hollow inside. During the winter, column crystals are commonly found in the high, wispy cirrus clouds. They help to create a halo around the moon on winter nights. The halo is created by moonlight streaming through these ¼” crystals. Rarely do these crystals fall to the ground. 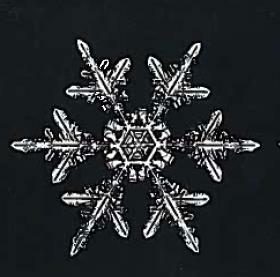 Asymmetrical Crystals are another common snowflake. They appear to be many hexagonal plates stuck together and have been mistaken for stellar crystals. They are about 3/8” across. Bullet crystals are column crystals that look like one end was sharpened with a pencil sharpener to form a hexagonal pyramid. 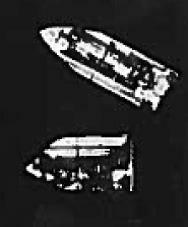 They can be seen either singly or in groups of three, attached by the points of the pyramid. Named for the Japanese drum of the same design, Tsuzumi crystals are column crystals with hexagonal plate crystals at each end. They form when the column crystals bump into the hexagonal plate crystals as the snow falls. 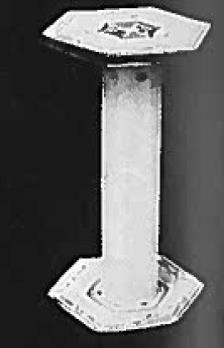 Needles are fine, six-sided columns with a point at each end; they range in length from ¼” to ¾” long. This is one of the most common types of snow flake in a snow storm. 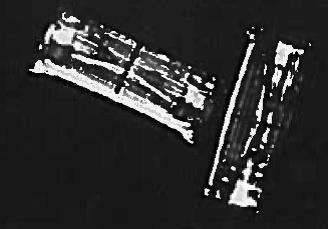 Sometimes the needle flakes freeze together during the descent forming conglomerate flakes. These conglomerate flakes quickly break apart as soon as the flakes hit the ground. Stellar Hexagonal Plate Crystals are some of the most stunning snowflakes. They form when either a stellar crystal goes through a hexagonal plate crystal cloud condition or a hexagonal plate crystal goes through a stellar crystal condition. These are some of the most common snowflakes in a storm. So is it true that no two snowflakes are alike? During school vacation try one of these family activities – preserving snowflakes or making a snow catcher. Bentley, W. A. and W. J. Humphreys, Snow crystals: 2453 illustrations, Dover Publications, New York, 1962. Griffin, Julia, The science of snowflakes, and why no two are alike, PBS NewsHour, 22 December 2011, http://www.pbs.org/newshour/rundown/the-science-of-snowflakes/. Martin, Jacqueline Briggs, Snowflake Bentley, Hougton Mifflin, Boston, 1998. National Oceanic and Atmospheric Administration, How do snowflakes form? The science behind snow. Stokes, Donald, Stokes nature guides: a guide to nature in winter, Little Brown and Company, Boston, 1976. National Snow and Ice Data Introduction to Snow.